What Delivra Triggers and Actions are Supported? New Unsubscribe - Triggers when contacts unsubscribe. Create/Update Contact - Creates a new contact or updates an existing contact based on email address. 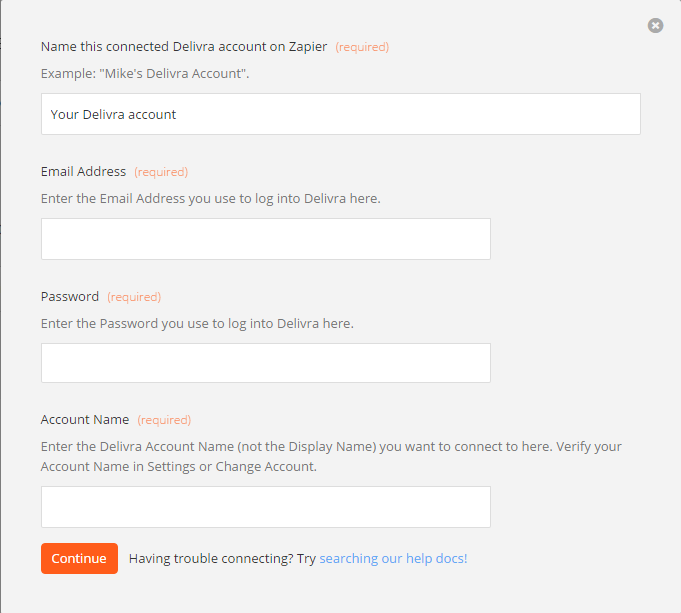 To get started with Delivra, first click to add a Delivra account to Zapier to be used in your zap. Next, you'll be asked for your Delivra email address, password, and account name. Once you've entered your email address, password, account name and clicked continue, we'll test your account to make sure the connection works. If it does, you're all set! Delivra checks for duplication based off email address for contacts, so any email addresses your Zap is trying to add that already exist in that account will update the existing contacts.